Camel Coat, Wine Red and Leo – I talked about the color combination of camel and wine red yesterday and thought I’d develop that idea today. A camel coat is one of the most classic, timeless, clothing pieces that exist which makes it a good wardrobe staple. Wine red adds a nice intensity to camel and therefore makes it a favorable color match. Go for a wine red skirt or pants! As talked about yesterday, when doing these two it’s important to add some energy to the outfit and make it more exciting. One way to do this favorably is to add some leo. Perhaps a pair of leo boots, a bag or a scarf? The leopard print works well with both camel and wine red – so the match is really detailed and cohesive! Snake Print with Orange – So the snake print is a trendy one this year and as talked about in the article, it’s fairly easy to style after season. Although orange might be more typical of summer, I think it can be a nice way to add more color to winter if you choose it with snake print. Perhaps an orange sweater with some snake print boots or if you own an orange coat? The idea is to pair the two together and let orange enhance the warmer tone of the snake print’s colors. Go for a more dark orange if you want to take it more subtle or add some wine red to balance the intensity of orange. Faux Fur Jacket and a Pleated Skirt – I love to work with contrasts when I style and contrasting structures is a really fun, but detailed one. A faux fur jacket is quite soft in its texture and the structure is pretty loose. That’s why it’s a chic one to pair with a pleated skirt as the pleated skirt is structured and geometric. Pairing the two together creates a dynamic outfit as the contrast is pretty intense. I suggest pairing in two contrasting colors (perhaps green faux fur and a copper colored pleated skirt) to enhance the effect. You can also, of course, just go for the styles you have – just make it clash or match! Statement Sneakers and a Maxi Dress – So if you live in an area without snow you can hopefully work the statement sneakers. What I like about these (sorry not sorry) ugly-looking shoes is that they’re such a perfect reflection of the 1980s/90s street style. It’s sporty, it’s an attitude and it’s chunky. The maxi dress is, often, more delicate and sophisticated in its look. The two makes up for an interesting combination as they’re unexpected together. I suggest going for a maxi dress that’s more delicate in a floral print or a sheer fabric to make the most out of the effect. Faux Leather Pants with a Chunky Sweater – To end this post with a simple outfit, I’m pretty sure that majority of us can recreate this look. Faux leather pants are pretty basic but yet adds a nice edge to an outfit with the leather look. The chunky sweaters are a must for winter 2019 as they’re cozy, warm but also terribly stylish. The more chunky, the better I think. Pairing these two will create a good dynamic between the leather material and the knitwear. A colorful sweater will add some energy to your outfit and if you also go for one with statement sleeves – you’ll have a fun volume to work with. Perhaps add some statement sneakers or leopard boots to give the outfit another trendy element? 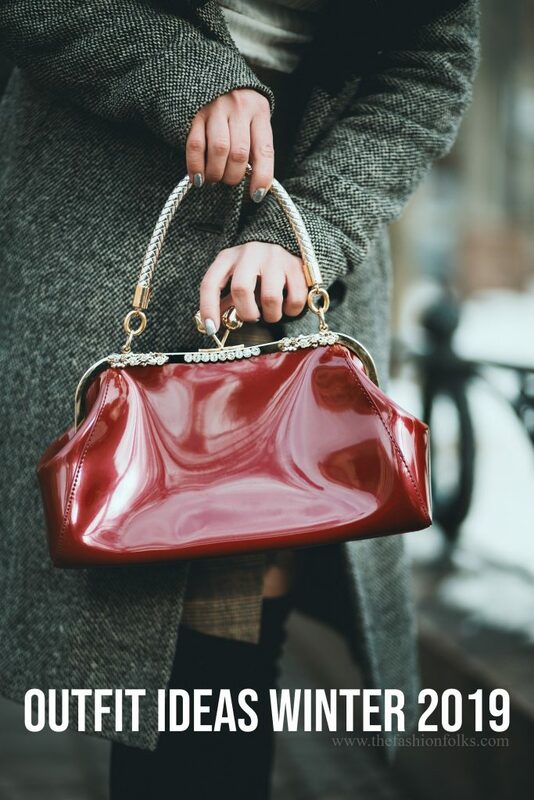 That red bag is cozy. It can be great companion. I am loving these suggestions! I have most of these items in my closet already but haven’t previously paired them. I’ll definitely be giving these pairings a try! Ohhh I love all of these winter outfit ideas! It’s been SO cold in DC lately! Love these suggestions and how they all have a cool fashion element!